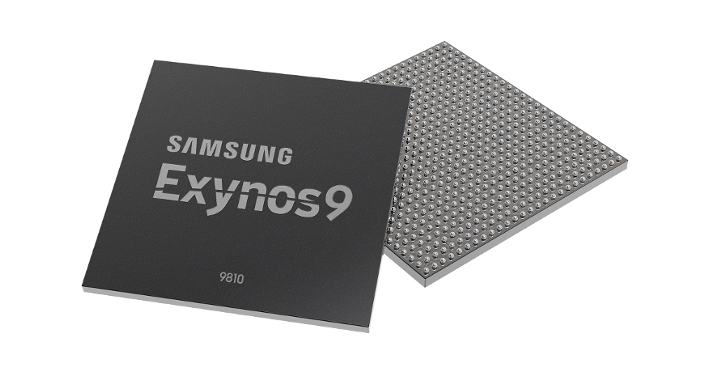 Samsung has announced the new Exynos 9 Series 9810 SoC based on the 10nm fabrication process. The SoC's high performance cores can reach 2.9 GHz and has a 6CA LTE modem along with the capability for deep learning processing. Today, Samsung took the wraps off its new Exynos 9 Series 9810 SoC promising increased performance and deep learning processing capabilities. The Exynos 9810 is being built on a second generation 10nm FinFET process and features a custom CPU, Gigabit LTE, and enhanced image processing supplemented by deep learning. The SoC features an octa-core processor that is a custom CPU having four cores clocked at 2.9 GHz and four optimized for efficiency. Samsung claims that the new CPU has twice the single-core and up to a 40% higher multi-core performance than its predecessor, the Exynos 8895 Octa. Artificial Intelligence (AI) is the next big thing in smartphones and we've been seeing chip makers incorporate hardware support for AI and deep learning technologies in their SoCs. Chip makers of the likes of Huawei with the HiSilicon Kirin 970 and Qualcomm with the recently announced Snapdragon 845 have given a lot of emphasis on deep learning. Samsung too seems to have joined the fray by equipping the Exynos 9810 with deep neural network learning processing that helps recognize people or objects in photos and enable hybrid facial scans for security. Similar to Apple's Secure Enclave and the Snapdragon 845's security processing unit (SPU), the Exynos 9810 also has a dedicated SPU to safeguard personal data. Connectivity features of the Exynos 9810 include a 1.2 Gbps Cat.18 Gigabit LTE modem with support for the industry's first 6x Carrier Aggregation (6CA). The modem supports a 4x4 MIMO 256-QAM antenna and uses enhanced Licensed-Assisted Access (eLAA) for LTE reception in unlicensed network bands. An upgraded multi-format codec (MFC) support enables energy-efficient image and video processing and video stabilization up to UHD resolution. The new MFC supports recording and playback of UHD video up to 120 fps and also comes with 10-bit HEVC decoding for enhanced color reproduction. The Exynos 9 Series 9810 is currently under production and can be expected to show up in the upcoming Galaxy S9/S9 Plus and the Galaxy Note 9 smartphones this year.